Contact Brent or Maggie at the High Country Motorcycle Camp! 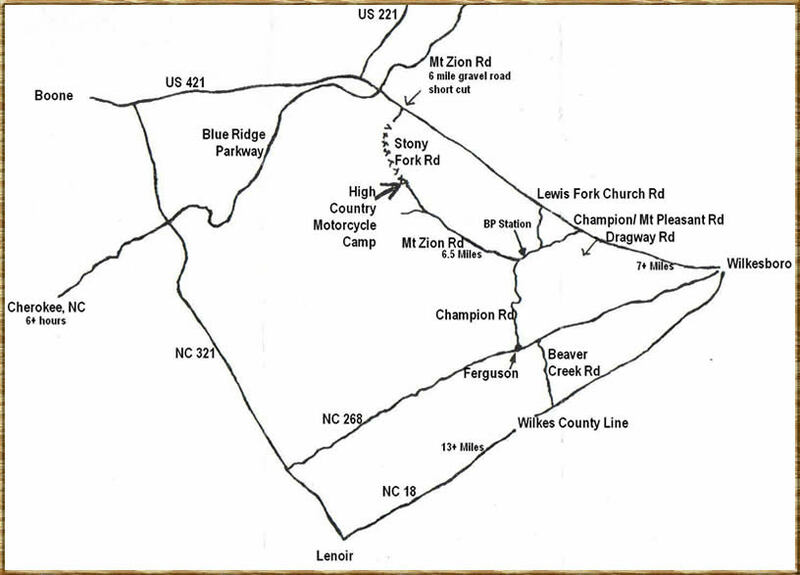 High Country Motorcycle Camp is located about 20 twisty miles from the Blue Ridge Parkway at milepost 276. After exiting from the Parkway, turn right and ride about 9 miles east on US 421 E until you reach Lewis Fork Church Rd. Turn right, ride to Mt. Zion Road. Turn right, ride about 6 miles. The Campground will be on the left. If you are coming from Wilkesboro, ride west on US 421 about 7 miles until you reach Champion/Mt. Pleasant road. Turn left, ride about 4 miles to Mt. Zion Road. Turn right, the campground will be about 6 miles on the left.